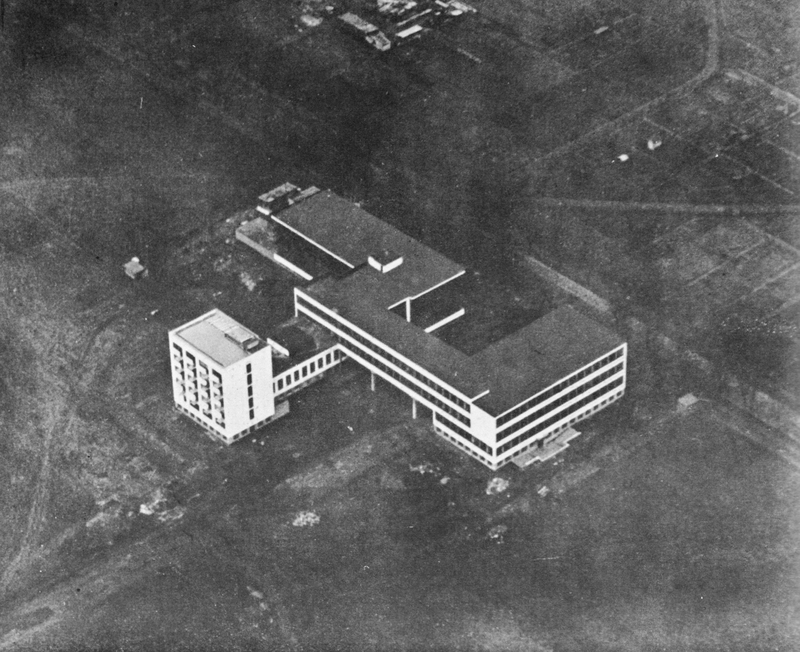 The first pictures in the Bauhausbuch #12 are taken from an airplane. An unusual viewpoint for a photo of a building, sure enough. The subject of these photos was the Bauhaus, just finished. An abstract composition of planes, rotated at a 45 degree angle, turns out, at closer scrutiny, to be a white building sitting on the dark earth, a field without any precise definition but for two faint lines that could be roads. 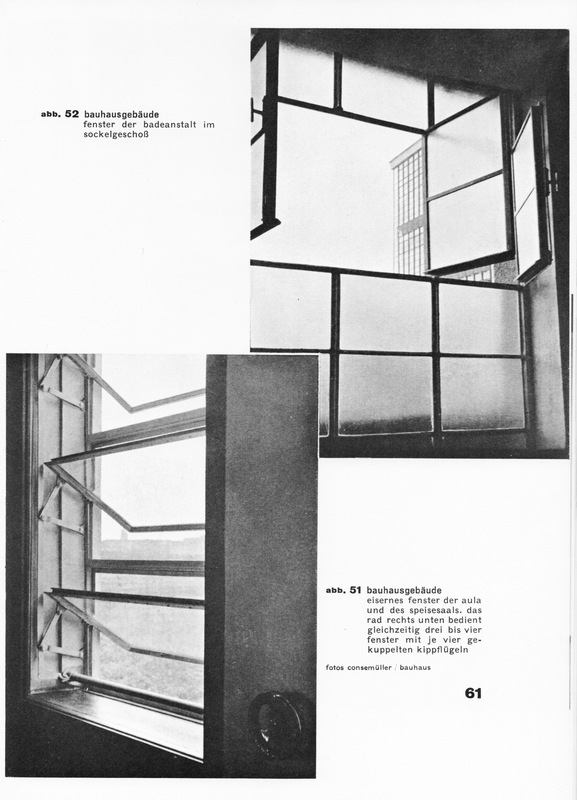 The book “gropius bauhaus bauten dessau” was designed by Moholy-Nagy. Laszlo Moholy-Nagy was an artist who, after WW I, had contacts with people like Kurt Schwitters and Hannah Höch, and who started working with the precepts of Constructivism and the Suprematism of Maliewitch. In 1923 Walter Gropius appointed him, at 28 years old, as a professor at the Bauhaus and he became the director of the influential preliminary course. His art from that time shows the floating planes and colors of constructivism. “We renounce volume as pictoral and plastic form of space. 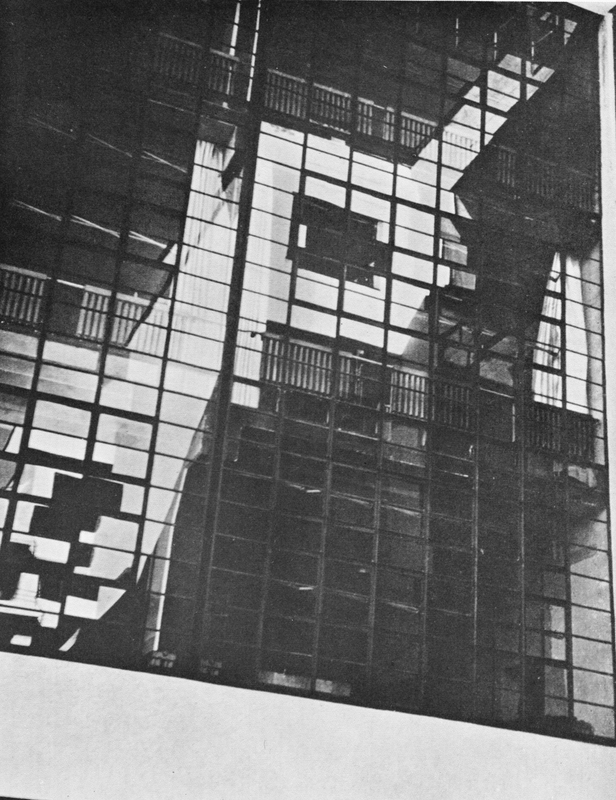 He also became a prolific photographer who transferred the new found constructivist sensibility to the photo paper. 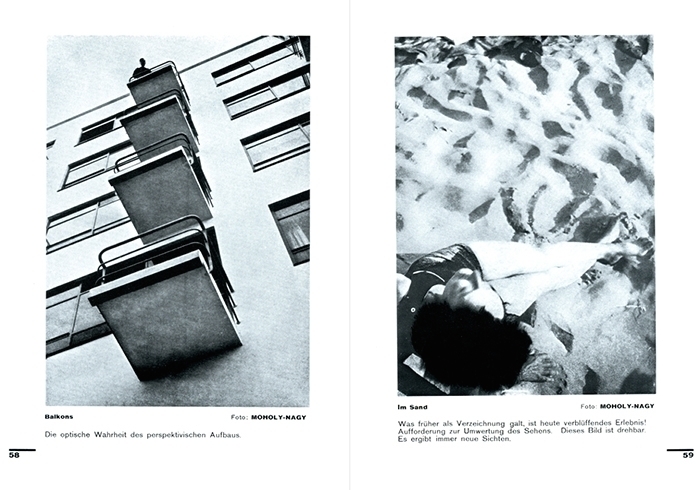 These new viewpoints are celebrated in the pictures in the Bauhausbuch. 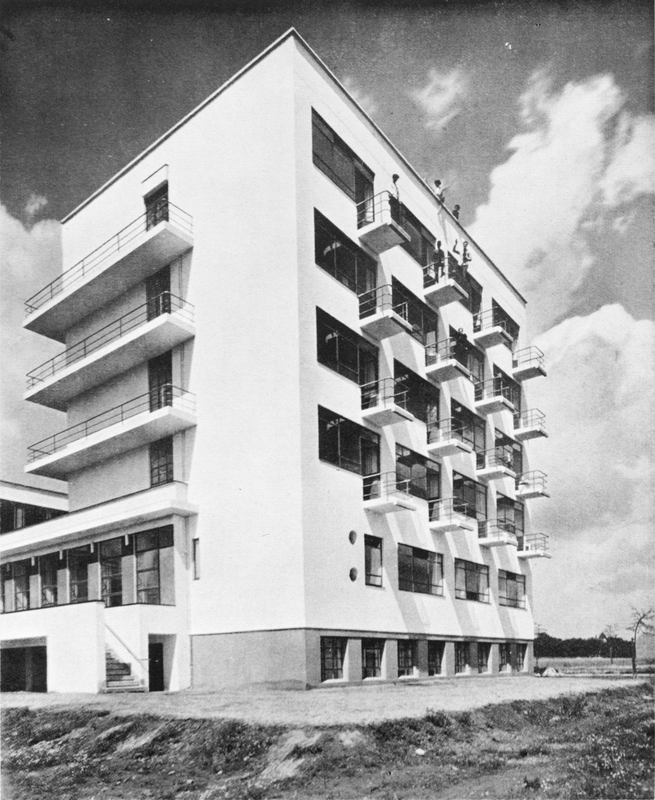 The Bauhaus appears as a gleaming white object. Building parts like balconies and windowframes are not just functional elements but show up as abstract forms. The photo gives a new justification to a shape by the way it is balanced on the picture plane. 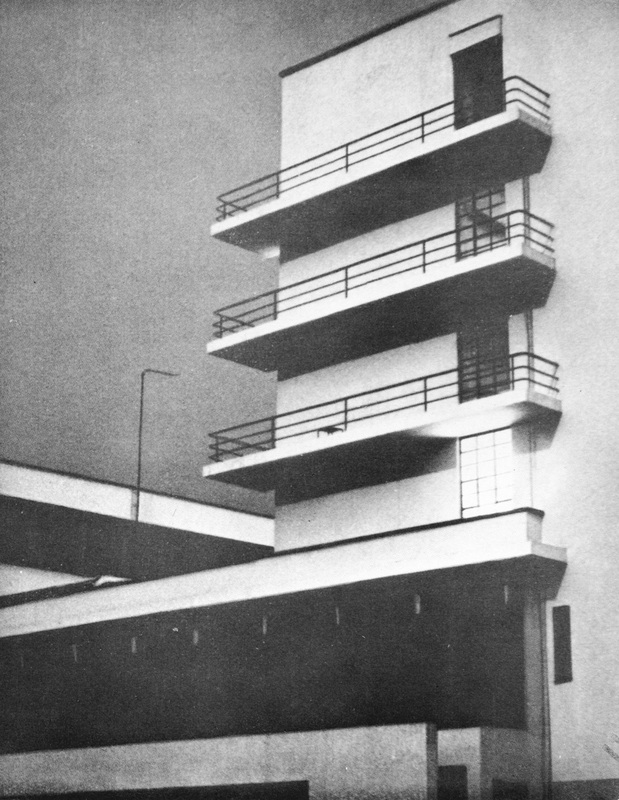 The people in a photo of the facade of the living quarters show a death defying attitude towards gravity, perched on the balcony railings and the roof edge. Everything wants to be weightless. This stresses the character of the building as a non-hierarchical composition. A composition of weightless volumes in which top or bottom, up or down, are no longer relevant; only the balance of shape and color is. This building has no front or back. In fact, it is hard to find the entrance. Then there appears to be two of them, one on each side of the road that bisects the building. “Clearly defined division of the separate parts of the organism” it says in the caption under a drawing of the plan, but it is more complicated than that. 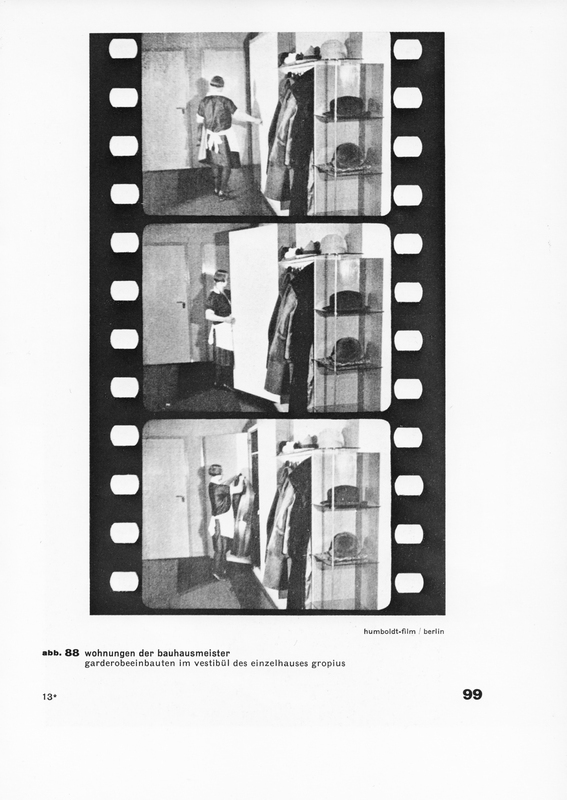 To define these these parts Gropius uses various formal ruses. 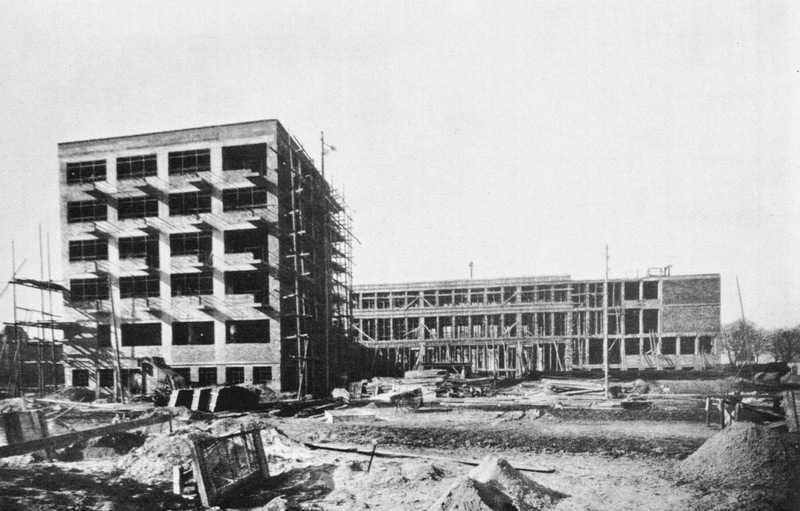 For instance, the “clearly defined part” of the administration department is structurally part of the construction of the two buildings that it connects. But a false raised roof edge defines it as a separate abstract bar that penetrates the volumes of these buildings. Also, this seemingly weightless bar has to be supported by a concrete beam and posts that are downplayed by their dark grey color – clearly an unavoidable necessitiy dictated by gravity that can’t take part in the play of white shapes. Similary, the volumes sit on a grey base, a humble facade of the servant space (it isn’t shown in the plans in the book) in the basement. These humble parts get their moment in the book, though. There are many photos that show the building as a construction, a proud display of concrete slabs, columns, cantilevers and fill in brickwork. Further along in the book there are pictures of the mechanism used to open the steel windows, a device to share a telephone between two offices, the light fixtures. These photos exemplify the aspirations to a disinterested functionalism – “a functional form is a good form”. This was the decade in which the word “beautiful” was exchanged for the word “good”. 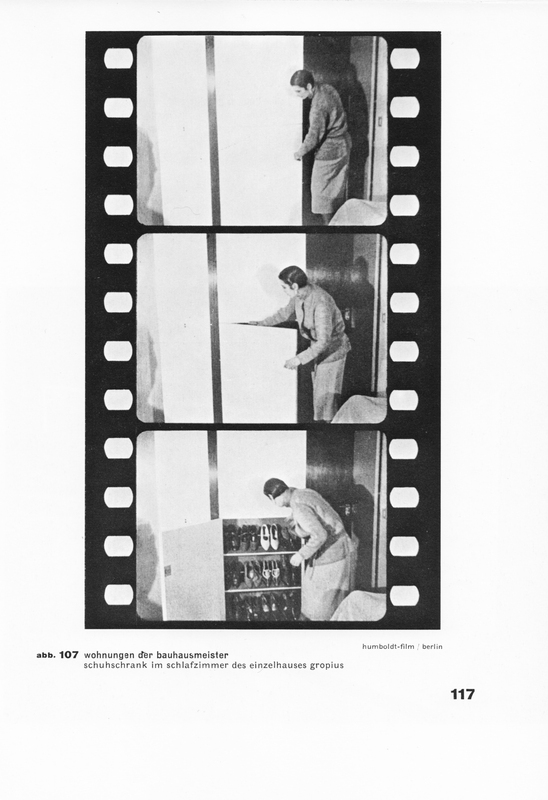 There are some charming stills from a movie, made at the same time, properly presented with their guiding holes, that show how Gropius’s wife or a servant girl use various cleverly designed items: a built-in coat rack, a well-organised wardrobe, a set of drawers in the working desk. 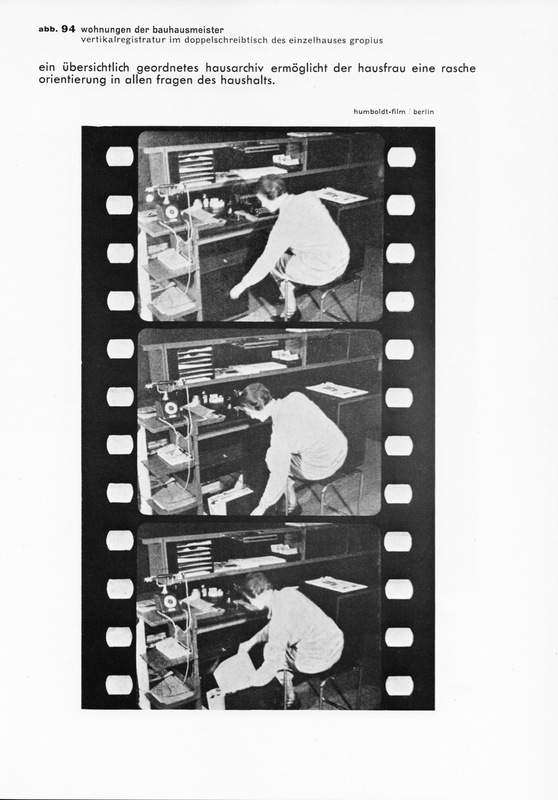 The sequence of movie images stresses the connection between the use and the form of the design. 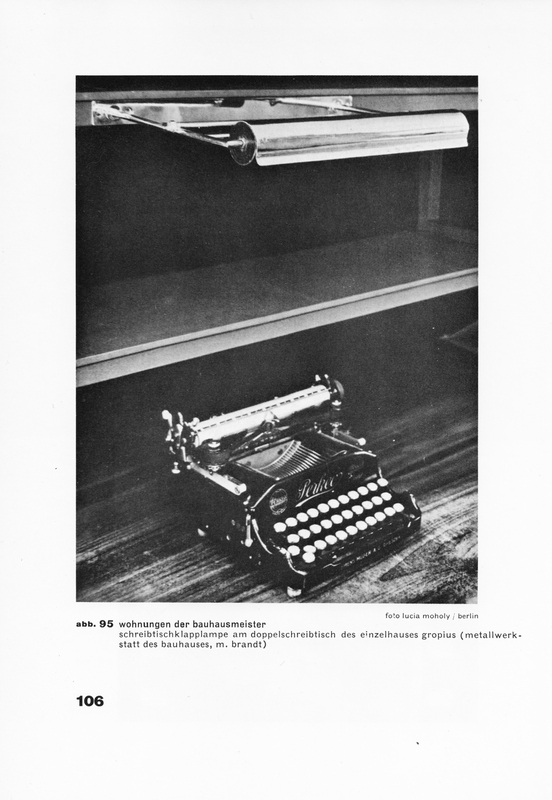 And yes, a typewriter is indispensable. 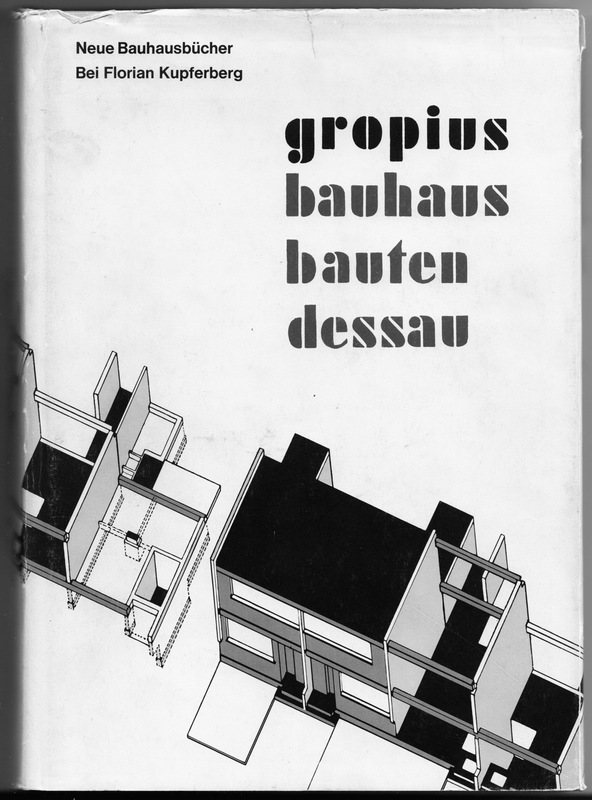 Gropius published the book in 1930. By then it was two years since he had left the Bauhaus and the villa that came with it. 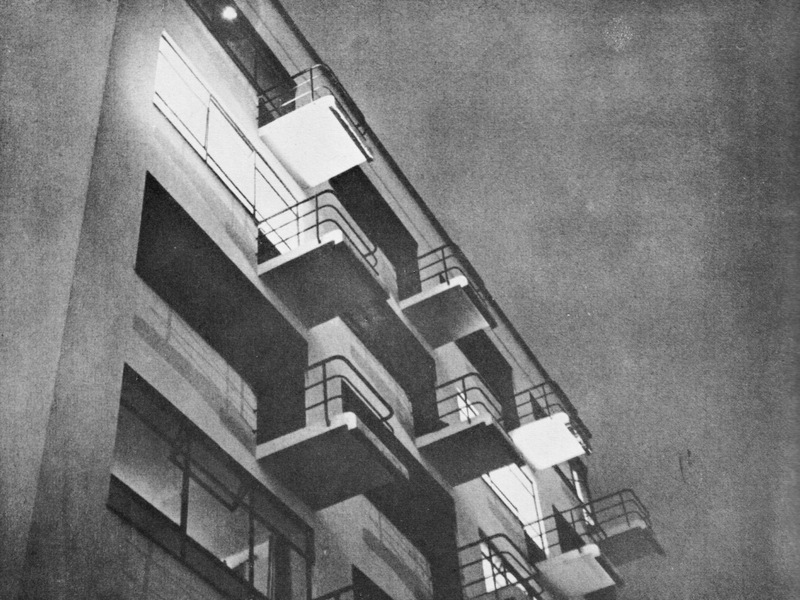 The photos still show the optimism that carried the Bauhaus. The text stresses the rational choices that underpin the design, but the photos aspire to something more than “good” design: a beautiful and, actually, happy future. Unfortunately, buildings never learned how to fly. This entry was posted in architecture, Uncategorized and tagged architecture, photography on May 11, 2014 by Reine.